As early as February, Met's Superintendent David Hartshorn was extolling that the 'Police are preparing for a "summer of rage"'. Predicted highlights included the G20 Summit: Xmas coming early for activists, and industrial disputes in reaction to the downturn in the economy. That gave plenty of time for the Police to ensure they were fully prepared for the - mostly peaceful - demonstrations and climate camp scheduled for April 1st. That's why the Police promotes 'a few simple rules to ensure that CCTV is not rendered useless' (image on the right taken from this campaign). And that's also a justification for the police using their own photographers and videographers, the Forward Intelligence Team (FIT), as was exemplified at the previous climate camp in Kingsnorth. In light of the above, it could have been expected that as part of its preparation, the police would have checked that all the CCTV cameras in the City of London were in good order. As soon as incidents had been known to happen the relevant footage would have been secured. Witnesses rapidly came forward about police brutality against peaceful protesters and about the assault on Ian Tomlinson. The IPCC has already received 120 complaints relating to police actions at the G20 demonstrations. However, key CCTV footage is still lacking. • 2009-04-01 During the G20 protests in the City of London, Ian Tomlinson, a newspaper vendor, collapses in Cornhill. He is pronounced dead at the hospital. He had been assaulted by a police officer minutes before collapsing. • 2009-04-02 The IPCC releases its first statement: in which it states it 'will be assessing the circumstances [and] will be examining CCTV and attending the post-mortem this afternoon, as is usual in cases of this nature.' Reports from witnesses start appearing; they are consistent in how the protesters went to help Mr Tomlinson. • 2009-04-03 The Guardian contacts City of London police - tasked with conducting the investigation into Ian Tomlinson's death on behalf of the IPCC - and says it has obtained photographs of him lying on the pavement at the feet of riot police. There was no evidence he was involved in altercations with the police. • 2009-04-04 Witnesses provide statements to the IPCC that Ian Tomlinson was assaulted by riot police shortly before he collapsed. A post-mortem examination finds he suffered a heart attack. Minutes later he is seen on CCTV walking back onto Cornhill from Royal Exchange Passage. Mr Tomlinson walks for about three more minutes, before collapsing on Cornhill. The CCTV shows that Mr Tomlinson was not trapped inside a police cordon at any stage. Several members of the public state that they tried to help Mr Tomlinson. Others reported the incident to nearby police officers. CCTV shows police officers forming a cordon around him near a group of protesters so that the police medics could give first aid. They then carried Mr Tomlinson on a stretcher through the Cornhill / Birchin Lane cordon and continued first aid. An ambulance then arrived and he was taken to hospital, but was pronounced dead on arrival. Commissioner Deborah Glass continued: “The investigation is continuing to look through CCTV footage to see whether the incident inside Royal Exchange Passage has been captured and we already have a number of witness accounts from the area. However, I would ask anyone else who saw Mr Tomlinson at about 7.20 p.m. or who may have taken a photo of him around that time to contact us so that we can build up a full picture of what happened. • 2009-04-07 The Guardian publishes on its website amateur video footage it received from a fund manager from New York that clearly shows Ian Tomlinson was pushed to the floor by a riot officer. This officer is seen with a baton. An IPCC investigator and a City of London officer visiting the Guardian's offices to be handed a dossier of evidence asked that for the video to be removed from the website. Channel 4 News publishes new footage that shows the moment a policeman hit Ian Tomlinson with a baton before pushing him (the footage was recovered from a camera that was broken in an incident). Yesterday evening, the IPCC was made aware of some footage of the incident running on a national newspaper's website. This was the first time we were made aware of the footage. An IPCC investigator immediately contacted the newspaper and collected the footage from them last night. This morning, IPCC investigators have been analysing that footage and, in light of this new evidence, a decision has been taken that this investigation will now be fully independent. This means that the IPCC will now use its own full team of investigators. To ensure that there is no loss of effectiveness, some specialist resources from City of London police will continue to be used to carry out forensic and analytical research for our investigation. Several police officers, including the officer who struck and pushed Ian Tomlinson have come forward. He apparently came forward after recognising himself on the video. In the group of police officers present during the assault on Ian Tomlinson, the riot officers were apparently from the Met and the dog handlers from the City of London police. He is from the Metropolitan Police’s Territorial Support Group (TSG). He was wearing a balaclava and no visible collar number. The IPCC later that day speaks to More 4 News to confirm Hardwick's comment, by saying that the CCTV cameras overlooking the incident were not working. On Thursday 9th April 2009 Nick Hardwick, Chair of the IPCC went on to Channel 4 news – just 24 hours after the IPCC independently took over the investigation in to circumstances surrounding Ian Tomlinson’s death. During the live interview he said - "We don't have CCTV footage of the incident... there is no CCTV footage, there were no cameras in the location where he was assaulted." At this point Mr Hardwick believed that he was correct in this assertion– we now know this may not be accurate. There are cameras in the surrounding area. From the outset it has been a main line of our enquiry to recover all CCTV from the Corporation of London and from all private premises in the area. This work is ongoing and involves many hours of viewing and detailed analysis. Anybody who saw Mr Tomlinson in Royal Exchange Square is asked to contact the IPCC on 0800-096 9071 or email Tomlinson@ipcc.gov.uk. The City of London Police are investigating the G20 Protests on 1st April 2009, under Operation Princess. Officers from the Major Investigation Team will shortly be attending various business premises throughout the City with a view to seizing CCTV evidence. It is anticipated that most premises will retain their CCTV for 31 days, but if for some reason your premises keeps it for less than that time please make contact immediately in order that your seizure can be prioritised. A photograph taken by Branthwaite around one minute after that alleged assault shows a CCTV camera affixed to a wall in the distance. Branthwaite has revisited the scene and taken more pictures of the CCTV camera, which she believes was pointed at the spot where she witnessed the first alleged assault. "It's difficult to know what the lens was like on that camera," she said. "But given where it was pointed along the whole street, directed into the centre of Royal Exchange Passage, it seems likely it showed the incident I saw. That attack occurred in that vicinity." 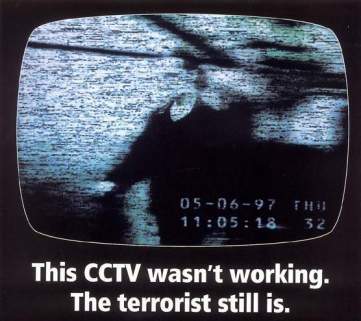 CCTV footage is missing when, by coincidence of course, it would be damaging to the police. Police hide their identification (such as the shoulder identification of this officer assaulting a woman in a vigil for Ian Tomlinson). Cameras get broken in incidents involving the police. And anyone taking a picture of a police officer risks falling foul of counter-terrorism legislation. As is clear from the above timeline, the IPCC was forced by the weight of independent video footage, photographs and witness statements to deal with the death of Ian Tomlinson directly. It took seven days to go from assessment to managed inquiry by the City of London police to an IPCC investigation. One wonders what would have happened if there hadn't been this wealth of independent, mostly amateur, material. 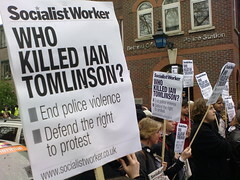 As well as a criminal inquiry into the death of Ian Tomlinson, there must be a public inquiry into police brutality reviewing Mr Tomlinson's death, the unprovoked violent behaviour of some police officers and the general police tactics, such as kettling, when managing peaceful demonstrations. There's also a need for a comprehensive review of the laws and guidelines affecting public video capture and photography. As has been demonstrated amateur and news video and photographic documentation is essential to police accountability and justice.